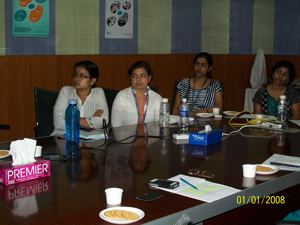 eWIT conducted “eWIT’s Excellence Award - 2012”, a Paper Presentation Contest, to unleash the potential of IT/ITES woman professionals, to showcase their talent and expertise in their respective areas, and this opportunity was extended to woman students too. 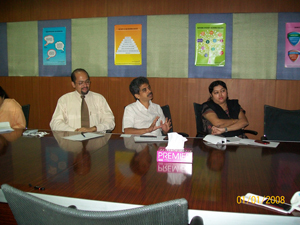 The oral presentation for all the categories was held on 17th March 2012 at Exemplarr's office. The event had a healthy and tough competition amongst the 4 short listed candidates each in all categories and the event was teeming with ideas and conversation. The panelists gave suggestions and ideas to candidates for improvising their presentation. The winners in each category will be rewarded with a cash prize of Rs.10000 and Rs.5000 for the first and second place respectively in eWIT’s 6th Anniversary event scheduled during the last week of April 2012. Our sincere thanks to the following panelists and judges, for their support and guidance to us, to make this event a great success. We look forward to your continued support for our future events. 1 Ms. Vidhya Srinivasan Principal consultant and CEO, Sarara Inc.
Ms. Jamuna Swamy, Head-Information Security Practice, Hexaware Technologies Ltd. substituted Mr. Anbuthambi for Oral Presentation. We would also like to convey our thanks to the volunteers from eWIT members companies who helped us in conducting the Oral Presentation sessions smoothly.